Rasika Kumar is the daughter and student of Mythili Kumar, Artistic Director of Abhinaya Dance Company. She began studying at the early age of four and performed her arangetram in 1996. Additionally, Rasika has studied abhinaya with Padmabhushan Kalanidhi Narayanan for several years and has trained under Sri C.V Chandrasekar. She has also attended workshops by several acclaimed artists including Smt. Bragha Bessel, Sri Madurai P Muralidharan, and Smt. Rama Vaidhyanathan. 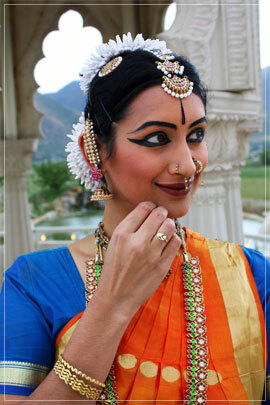 Rasika performs regularly as a soloist and as part of Abhinaya Dance Company’s ensemble in the greater Bay Area. She began performing as a company member in 1996, with major roles in several of Abhinaya’s productions from 1996 till 2000. In 2000, she moved to Cambridge, MA to attend the Massachusetts Institute of Technology (MIT). There, as a member and later president of Natya, MIT’s classical dance club, Rasika organized, choreographed, and performed in various events in the greater Boston area from 2000 until her graduation in 2005. Rasika spent the fall of 2004 living and training in Chennai, India, studying under Padmabhushan Kalanidhi Narayanan and Sri C.V. Chandrasekar, and performed in the annual Chennai music and dance festival to critical acclaim. 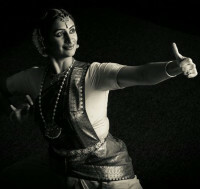 In 2005, she returned to Bay Area and continued performing with Abhinaya. Rasika has been a featured soloist since 2005 and assistant choreographer since 2006 for many of Abhinaya’s productions. While working as a software engineer at Google, Inc, Rasika continues to perform and tour both as a soloist and as part of Abhinaya’s ensemble in the San Francisco Bay Area and across the United States. Under the guidance of Mythili Kumar, Rasika has been choreographing solo and group pieces for Abhinaya since 2006. Her choreography has been featured in several performances and company productions including Saatvika (2006), Ritusamhara (2006), Poetic Splendor (2007), Prithvi (2007), Dharma Yuddh (2008), Rivers: A Mystical Journey (2008), and Nritya Sangati (2009). Rasika’s choreography and performance have garnered attention from beyond the Indian dance community. “Varsha: the Rainy Season,” jointly choreographed by Rasika Kumar and Mythili Kumar and performed by members of Abhinaya, was chosen to be performed at the 2007 Ethnic Dance Festival and also received an award and commision for the 2008 Festival. Additionally, “Prithvi Sooktam, ” choreographed by Rasika in 2007, has been selected to perform at the 2010 Ethnic Dance Festival. Rasika has been selected to perform her solo choreography for sjDANCEco’s Annual ChoreoProject Award in 2007, 2008, and 2010 and for the WestWave Dance Festival at the Yerba Buena Center for the Arts in 2008. She is also the recipient of the Arts Council of Silicon Valley Performing Arts Fellowship for Dance Choreography in 2008. I was just getting my feet wet in the field of dance choreography and the fellowship gave me a huge boost of confidence to continue doing so. I still do a lot of dancing and dance choreography. My work has changed in scale greatly as I've taken on more artistic direction for productions. Learn the business of art so you can create AND be successful! Brimming with talent. Less pay.